Two down and nine to go. Amazing Race teams, that is, and not necessarily episodes remaining. Last week was a truly unique beast with essentially seven teams tying for first place. Okay, that's a bit of an exaggeration but when you have that many teams all gathered on the mat in front of Phil within a span of five minutes, then there isn't really a clear time advantage in how they finished. Based on that, these rankings are more indicative of how they raced and what they have shown us the first legs. 1. 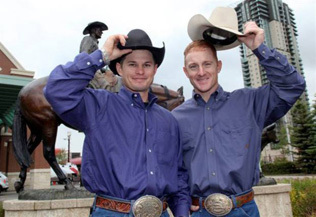 Jet & Cord: Cowboys/The Lone Rangers. It may cursing the cowpokes but I feel like they deserve to be at the top. Yeah, they stumbled to last halfway through the leg by failing to understand the local man's direction but they blew through both the Roadblock and Detour. On top of that, the brothers were able to unload the second Express Pass to a team that was likely going to be eliminated, which ensured that it would be used immediately. That was their ideal situation for the Pass and Jennifer & Caroline's frustration and floundering at the Roadblock was perfect. The biggest obstacle the guys face is themselves and racing too well. As Flight pointed out last leg, they know the cowboys are strong and efficient racers. That's just foreshadowing of a U-Turn if they aren't careful.